Fitness, beauty and hard work run in the Demske family. Learn how Maizee built an incredible body with the help of two great personal trainers: her parents! 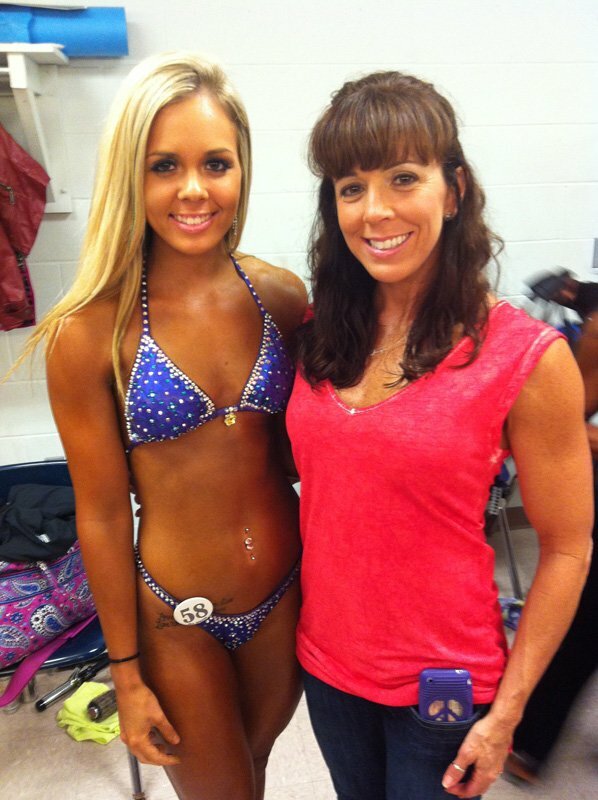 I have been surrounded by health and fitness basically my whole life because my parents are both personal trainers and own their own personal training studio, Sports Kick, Inc.
My mom, Carmen Demske, got into competing and she competed in figure at a national level for five years. She has inspired me to become more serious about fitness and achieving my goals regarding my body. She has also inspired me to push myself and challenge myself by competing and following in her footsteps. My mom and my dad coach, train, and diet me for my shows. Competing or not, my workout plan typically remains the same. I do 30 minutes of cardio on an empty stomach when I wake up in the morning 7 times per week. Then in the afternoon I'll do my weight workouts which are 4 times per week. I do a plyometric circuit after my weight workout 3 days out of the week. My mom also teaches a 45-minute kettlebell class twice per week that I do as well as a full-body weight lifting "Blaster Class" that I attend once per week. Full-body, group based weight workout. My nutrition plan stays fairly the same whether I'm competing or prepping for a show or not. I like to eat clean on a regular basis because it makes me feel good, energized and there's no guilt to go along with it. The supplement that has given me the greatest gains would definitely be Juice Plus+ because it fills the gaps when it comes to lack of fruits and vegetables. I am always able to get my servings of fruits and vegetables by just taking the capsules. Another supplement I use is NOW BCAAs by after my workout for recovery and muscle growth. NOW L-Glutamine, used after my workouts, contributes to my muscle recovery as well. I love bodybuilding because dieting and training as intensely as I do puts me in control of my own body. In a sense, I am controlling how my body looks and how my body feels by what food I'm putting in and how hard I'm working out my muscles. I feel strong and motivated during my workouts and I look up to others who participate in the sport as well. I can relate to how hard and challenging it is and I respect all the other athletes. My mom and dad are definitely the biggest motivators in my life. They have been by my side throughout my entire journey when I first began. My dad has been prepping my food, making sure I complete all my workouts and helping me through it all. My mom has taught me how to pose, different exercises and has given me so much knowledge and advice. Just with their support alone has motivated me to keep going and achieve the best body I can have and also a healthy fit lifestyle. I want to achieve my goals because I wanted to accomplish something incredible. My parents have been a big inspiration for this and I just wanted to do something for myself that would make me happy and I would be proud of myself. I plan on competing in a good amount of shows this year, the first show being a local show on February 25, 2012. Last year I competed in the figure division for my first two shows. This show will be my third show but I will be in the Bikini division. I feel like my body is more suited for this category because it fits the body type my body currently has. The tip I would give other competitors is to never give up. I know it's tough, but hard work does show if you just keep pushing through. You shouldn't be in the mindset that you're competing against the other people. You should be striving to be the best you can be and you're competing with yourself. My favorite competitors first and foremost would be my mom, Carmen Demske. As far as IFBB Pros, I look up to Nicole Nagrani for being so young and accomplishing what she has. I also like Nicole Wilkins and Monica Brant. I'm always on Bodybuilding.com looking at the new products and all the different supplements. I also like checking out all the blogs and advice that other people as well as the site provides.